On my desk there is a myriad of bits and pieces, leftover from other projects, or die cuts etc given to me by my crafty friends, and I try to use them as they appear but sometimes the pile grows and grows! I am determined to get to the bottom of this pile and see my desk again,so todays card uses one of these bits.It is a die cut, I think it’s a cuttlebug die and embossing folder in one, and I have backed it with some patterned paper from kaisercraft Christmas wishes,and decorated with more fussy cutting from the same range.I survived my week of night shift, (glad it’s only once a year though) and as a reward to myself I popped into Paper Flourish yesterday and bought some new papers. Bo Bunny, Graphic 45 and kaisercraft all featured in my shopping basket!The Kaisercraft Ooh La La especially is worth checking out, I love it! Til tomorrow…. Kaisercraft Christmas wishhes and dies 3 and 4..
My two Kaisercraft Christmas wishes cards today use very little paper,just some baubles fussy cut and the background paper for the reindeer. The main focus are the dies I used ,kaisercraft christmas ones from last year which cut beautifully. I added some bling and some kindyglitz on the reindeer and some little bows on the christmas tree. These are the dies I was looking for the other day, I am glad to report they have turned up! I put them on the shelf behind my desk for easy access, clever idea if only I had remembered that! Til tomorrow…. I always enjoy going over to my sister Kays craft room,because she has so much more goodies than I do! ( I know!! ), and she often says play with this and see what you come up with. 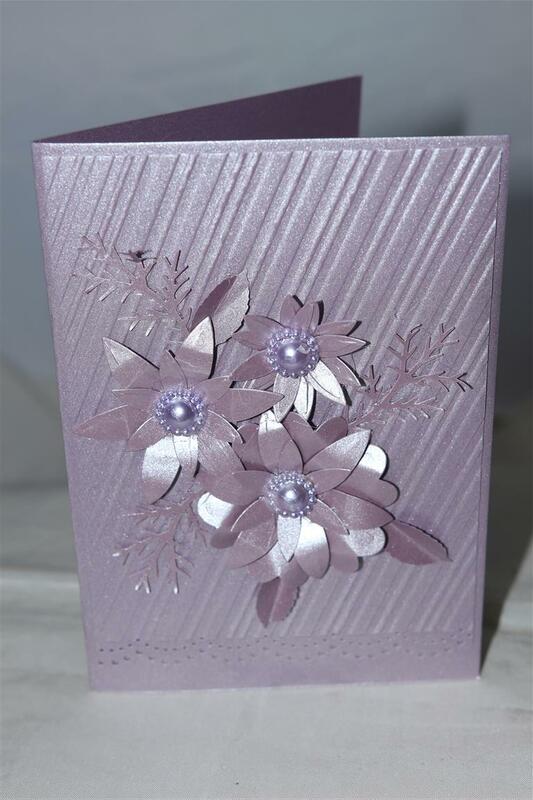 On this particular day it was a Stampin Up die called Detailed Floral thinlet,and these were two of my creations. I used Night of navy and whisper white cardstock, and popped some gold card behind some of the detail on the card on the right, and followed the shape of the die cut on the card on the left for a bit of a border effect, white ribbon,touch of bling and a rose flower to finish off these rather elegant cards! Today I have been over at mums showing Mum and Kay how to watercolour with inks..this was necessary beacause Kay will be accompanying me on my cruise,and I am relying on her to help me teach my classes so she must know what we are doing!Anyway we had great fun,and now I am looking forward to spending an hour or so in the craft room after tea where I have a couple of orders to put together…til tomorrow…. Too Early for Christmas cards? Is it too early for christmas cards? I was over at my sisters craft room a few weeks ago playing with all her new stampin Up products, and I made this card with some scrap cardstock and a couple of dies from the stampin up die sets – Birds and blooms, and Flourish, It wasn’t until I had made it that I thought it might be ok for christmas , I see though that the bling has moved around a bit so will fix that before I add it to the christmas box! And today a photo of a sleepy Luna, she was hanging around when we were taking the card photos!Til tomorrow…. Cheating today, its been a very busy weekend, and I can’t beleive it’s back to work tomorrow! so todays card is the same as yeaterdays, but just a different colour. All dies as listed on yesterdays post, and for me..it’s off to bed!til tomorrow….